Fun gift plaque for a little boys room! Cute digital design and graphic. 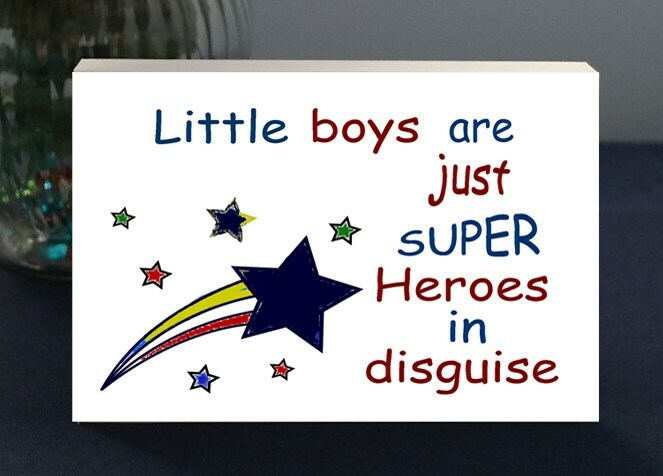 Little Boys Are Just Superheroes in Disguise. Fun digital designs and photo gifts sold at Absolute Inspirations Gift Store on Etsy. 2 sizes are available: 5 x 7 or 8 x 10 both sizes can stand alone or be hung for a unique standout look. We offer Black and White substrate/mount colors. Regarding our turn around time: All customized gift orders will be received and processed Monday – Thursday. All orders received from Friday – Sunday will be received and processed on Monday. These are designed for you and it usually takes 2 - 3 business days to completely create a gift and ship it out on your behalf. We are happy to add a hand written note to accompany your gift! Let us know what you want on your note in the add a short message.